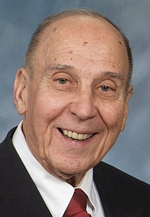 Retired Permanent Deacon Edward A. Konarski died April 17 as a result of heart failure. He was 91 years old. Deacon Konarski was born and raised in Larksville, Pa., in the Diocese of Scranton. He and his wife, the former Dorothy Malahowski, moved to the Archdiocese of Philadelphia following their marriage on Dec. 2, 1950. Deacon Konarski and his wife were married 67 years and had four children, Deacon Edward A. Konarski Jr. of the Diocese of Charlotte, Mary Lynn, Karen and Ann; also six grandchildren and three great-grandchildren. Deacon Konarski was ordained at the Cathedral Basilica of SS. Peter and Paul, Philadelphia, on May 23, 1993, by Bishop Louis A. DeSimone. He was assigned to his home parish of St. Rose of Lima, North Wales, from the time of his ordination until his retirement on Jan. 17, 2014. He also had a secondary assignment with the Metropolitan Tribunal from September 1999 until January 2014. Deacon Konarski served in the United States Army from Dec. 11, 1944 until he was honorably discharged on Aug. 23, 1946. Deacon Konarski held a Bachelor of Science degree from Kings College and a Master of Arts degree from Villanova University. In 1988, he retired from the Merck Co. where he held the position of Director of Purchasing and Materials Control. The funeral Mass was celebrated April 23 at St. Rose of Lima Church, North Wales. The main celebrant was Bishop Timothy C. Senior and the concelebrant and homilist was Msgr. James J. Graham. The Deacon Assisting at the Liturgy of the Word was Deacon Robert P. Ghode and the Deacon Assisting at the Altar was Deacon Leonard D. DeMasi. Chaplains were Deacons Jack Betzal and John Campbell. Interment was at the National Shrine of Our Lady of Czestochowa Cemetery, Doylestown. In the future, it would be a good idea to contact the family for accuracy prior to posting an obituary. My name is Anne Bennett, my sisters: Marylynn Puhak and Karen Konarski. Do we not deserve not only the correct spelling or our first name as well as our surnames as afforded our brother? Although we relied on information from the Office for Clergy, the responsibility lies with CatholicPhilly, and we regret the error.